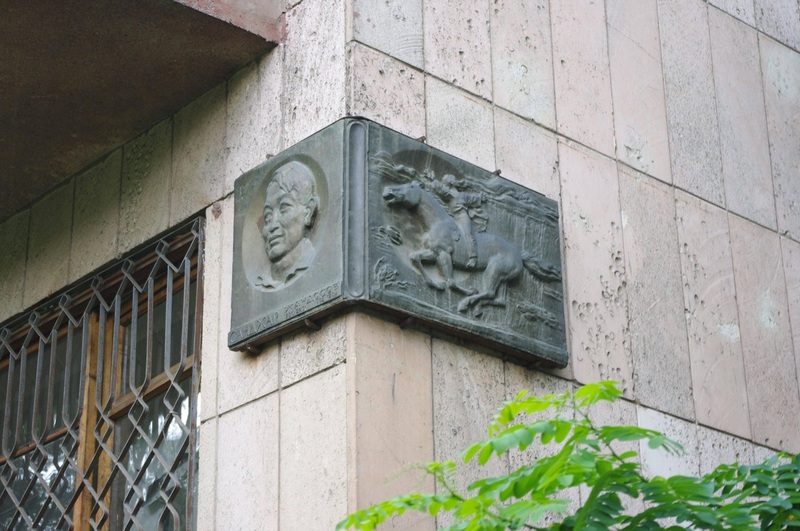 In the middle of Almaty you can find what's called the "Golden Quarter" [Золотой Квадрат; Zolotoy Kvadrat], the elite neighborhood that built its reputation not just on its beautiful Stalinist architecture but on its status as the center of the Soviet intelligentsia. 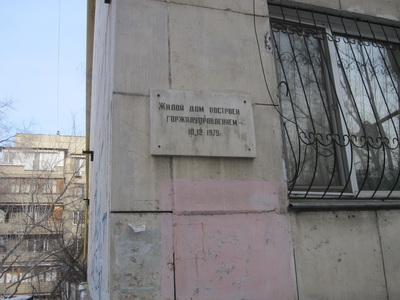 In case you doubt it, the buildings themselves announce the resumes of their former tenants: Here lived in such and such years the national poet of the Kazakh SSR; the national ballerina; the esteemed philospher and geologist. 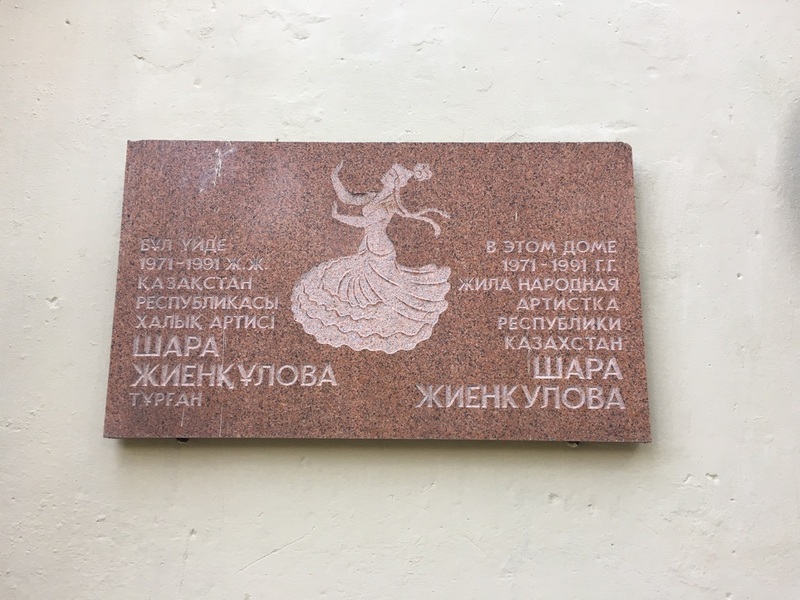 Walking down Tulebaeva, perhaps Almaty's most illustrious street, it's a revelation to read every plaque and imagine that this quiet green alleika once housed the creme de la creme of Soviet society, famous neighbors sharing stairwells in modest apartments with the same floorplans. 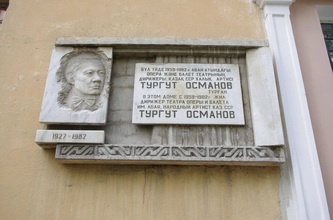 Of course there will be few figures of international renown featured in these commemorative plaques, or memoralnye doski [меморальные доски], but to read their bios etched in marble, granite and gypsum, one can't help but feel the gravity of personalities that dominated their place and time. 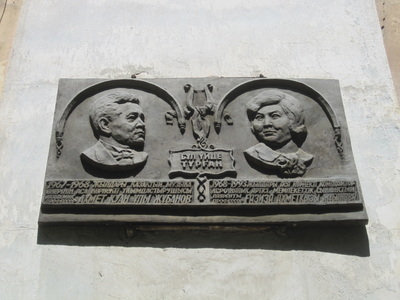 Beyond the curiosity that these short bios inspire, the plaques are often beautifully-realized works of sculpture, a genre with constraints all its own. 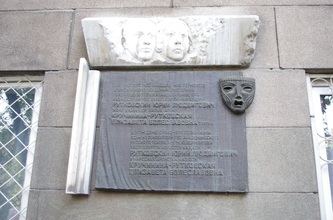 You can see plaques shaped like books, flags, theatrical stages and tablets. 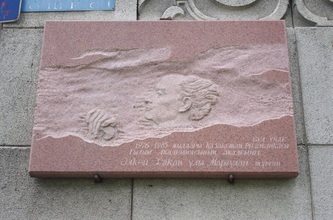 They wrap around corners and thrust themselves into 3D space. 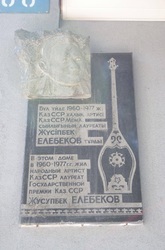 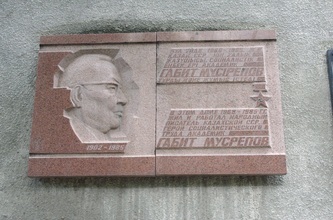 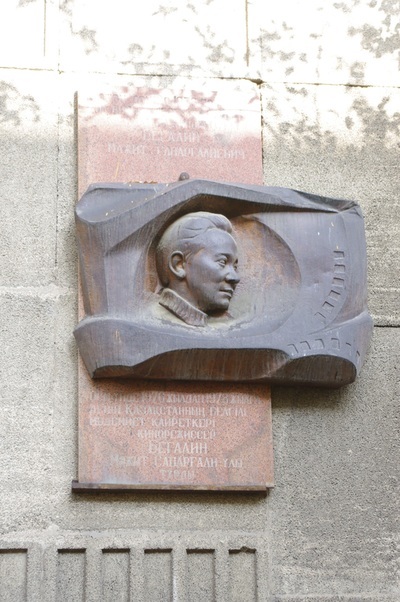 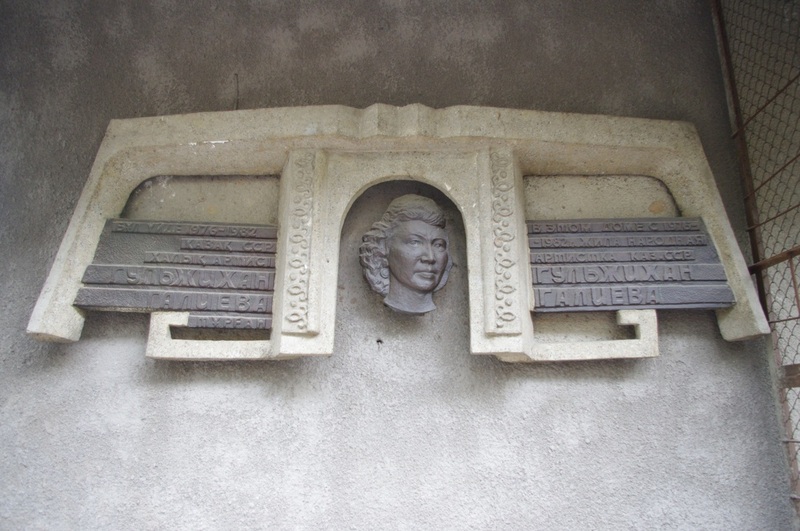 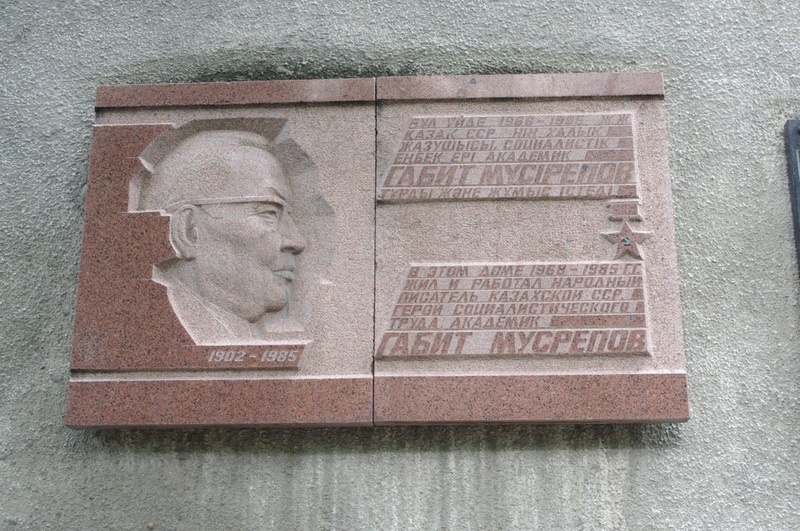 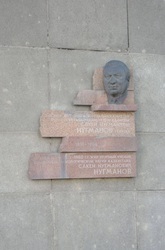 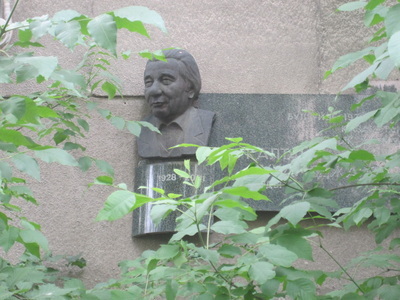 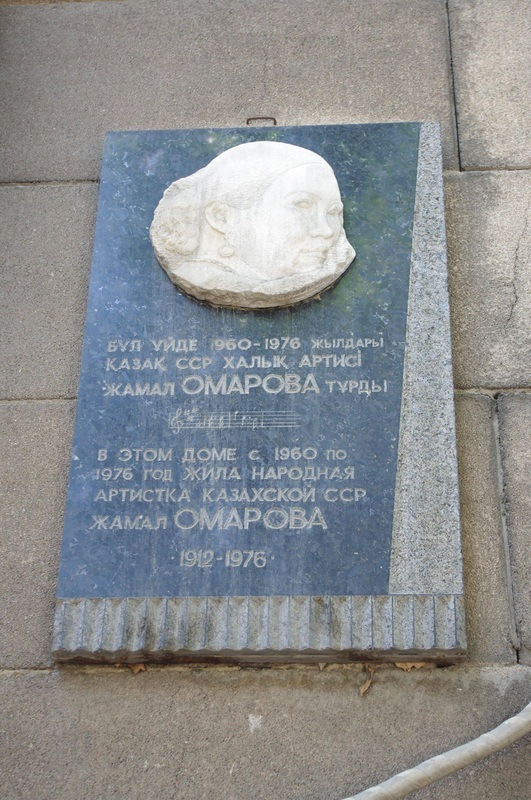 The Soviet-era plaques were bid on by the Artists Union, and for many sculptors these may have been their works most publicly seen and admired. 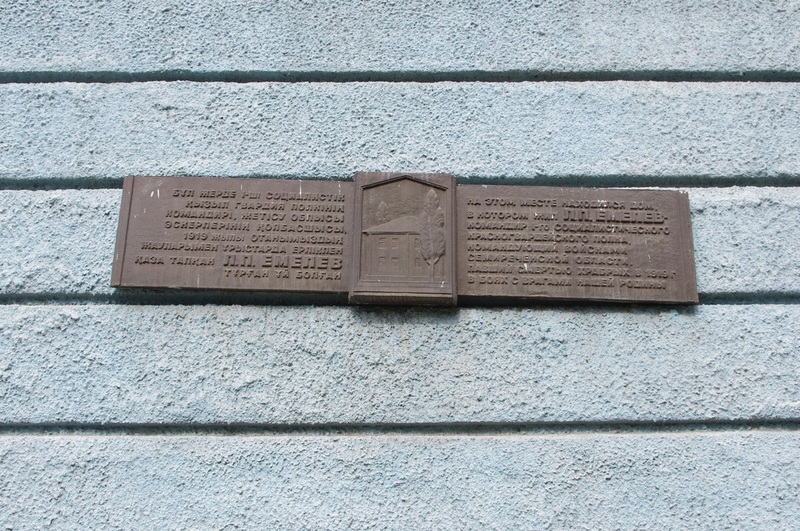 Independence-era plaques, without the funding of the state, are usually minimalist slabs of marble with nothing more than a short bio in print. The art of the memoralnaya doska has died out. 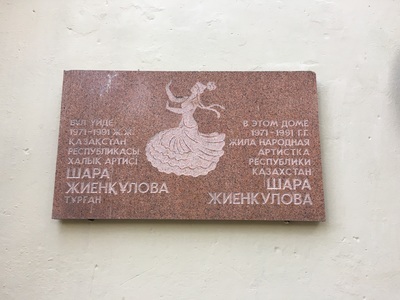 Though the plaques these days are less ambitious, in at least one instance a modern installation has turned the form into a medium for satire. 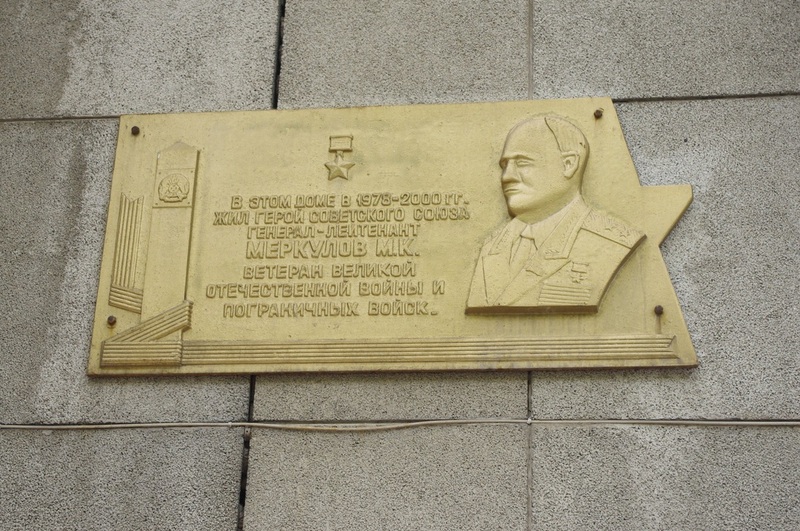 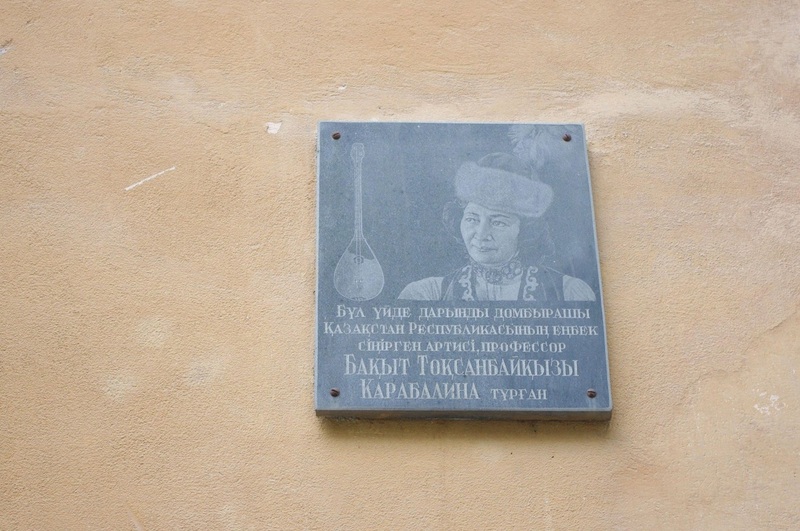 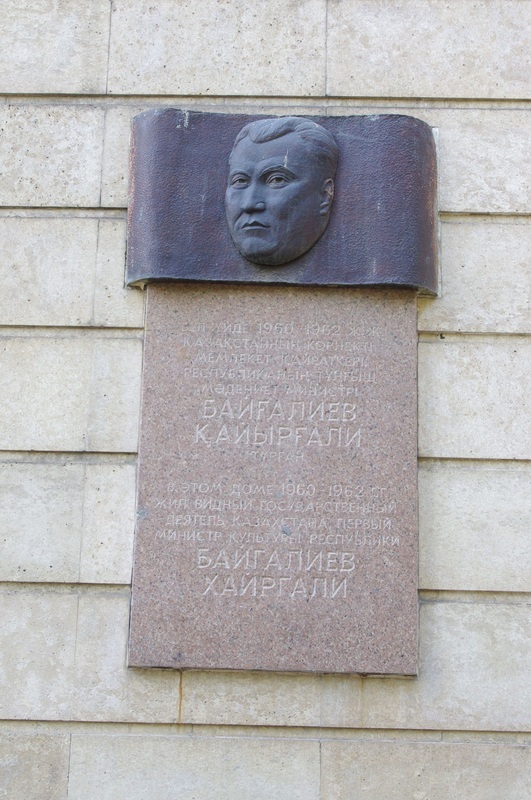 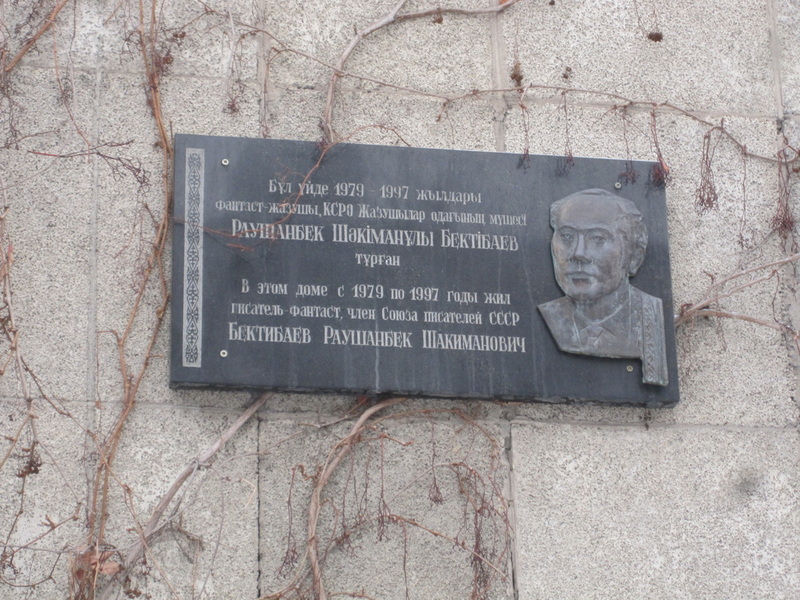 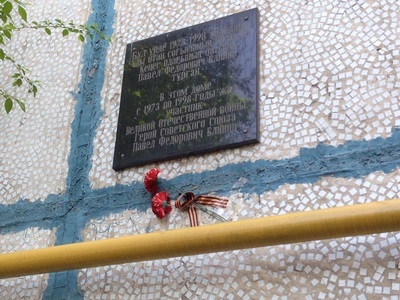 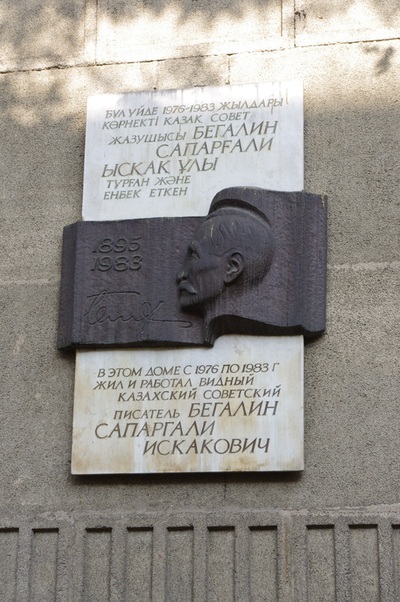 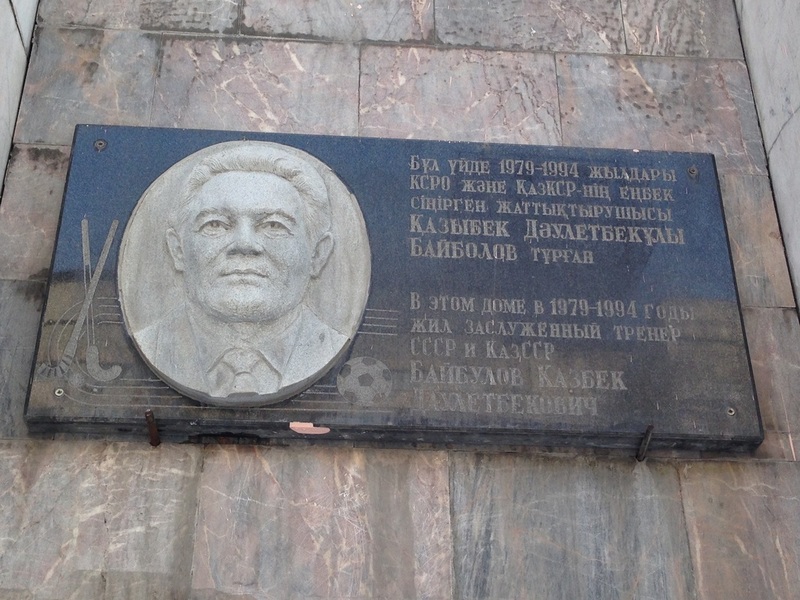 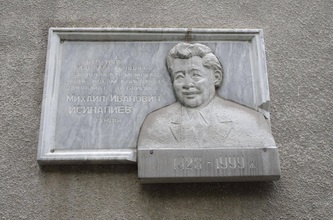 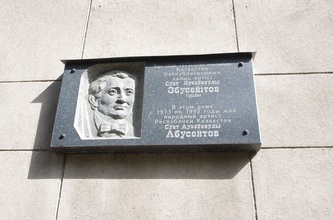 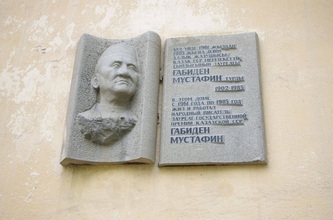 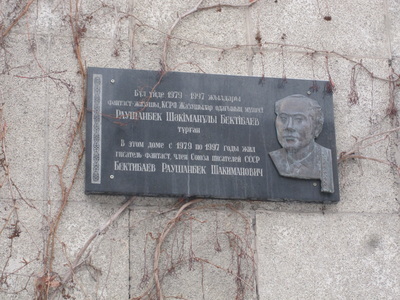 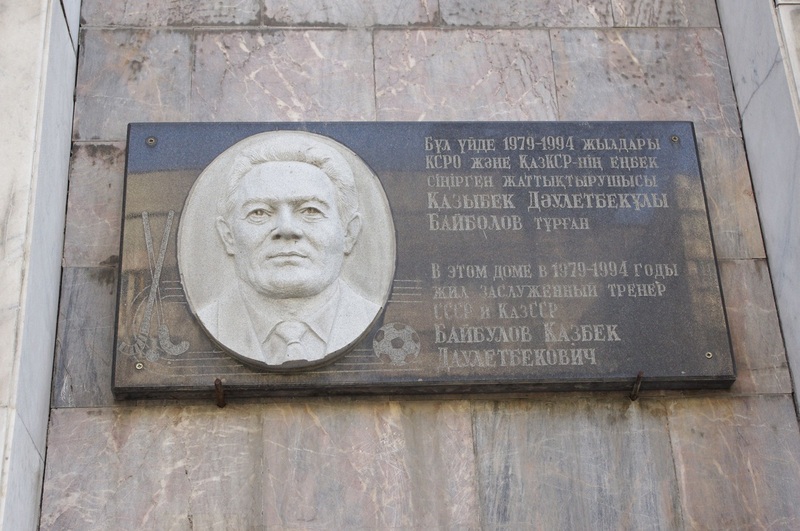 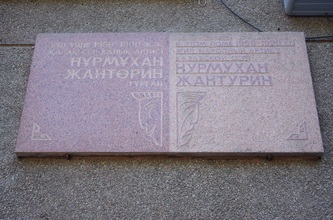 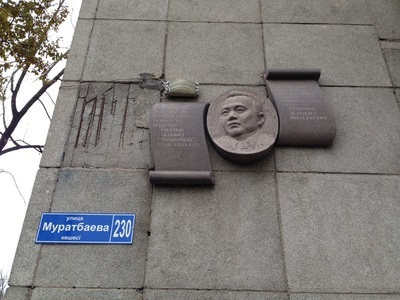 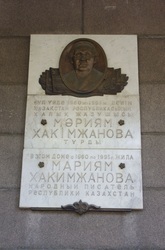 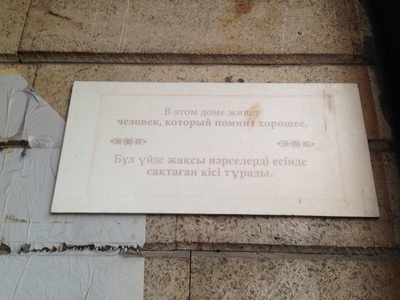 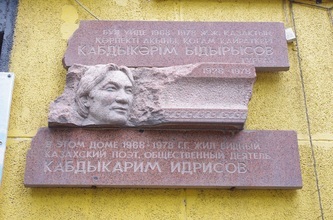 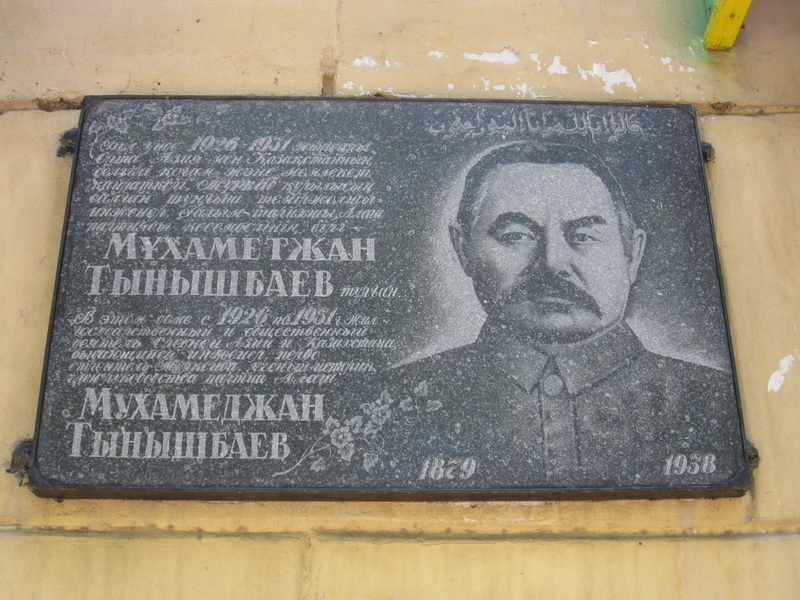 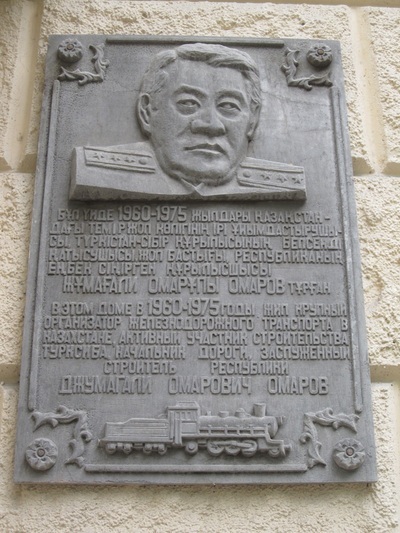 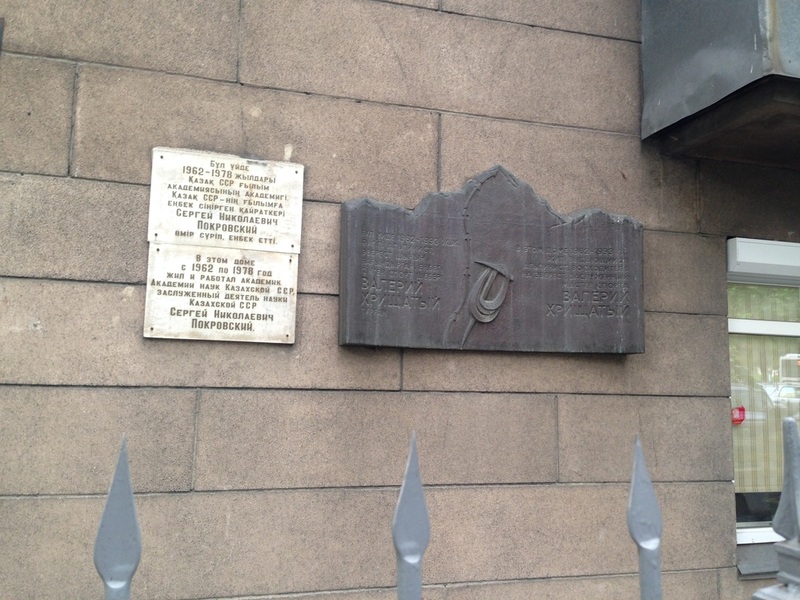 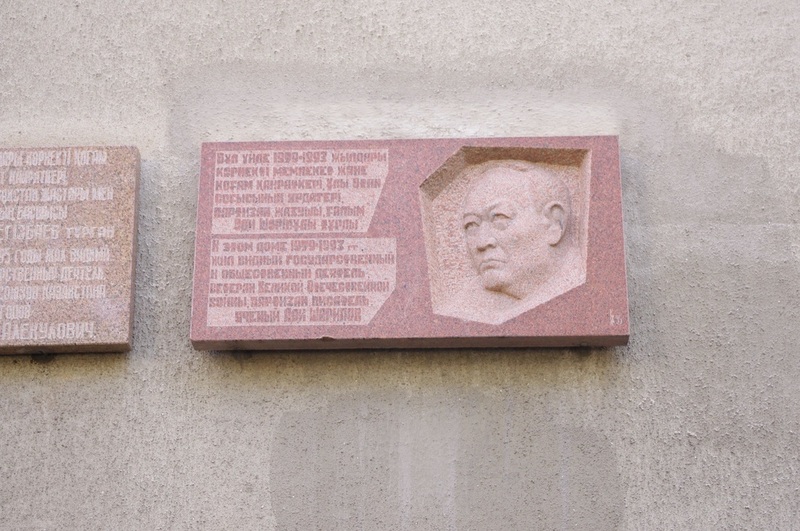 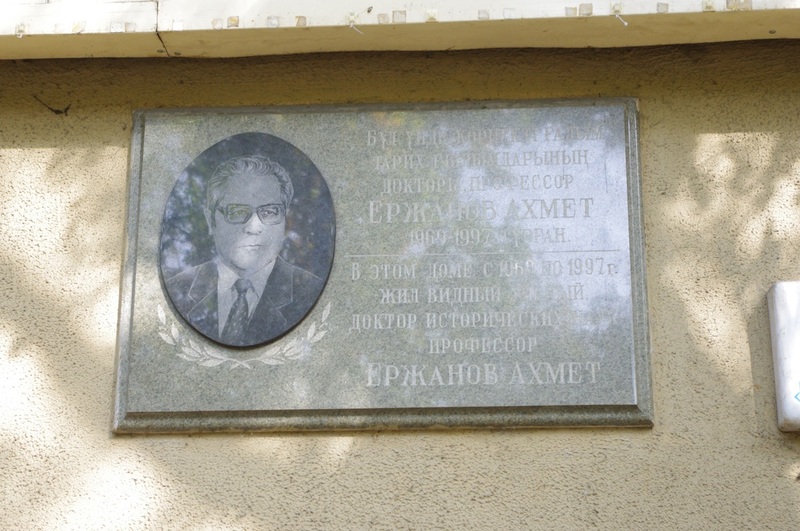 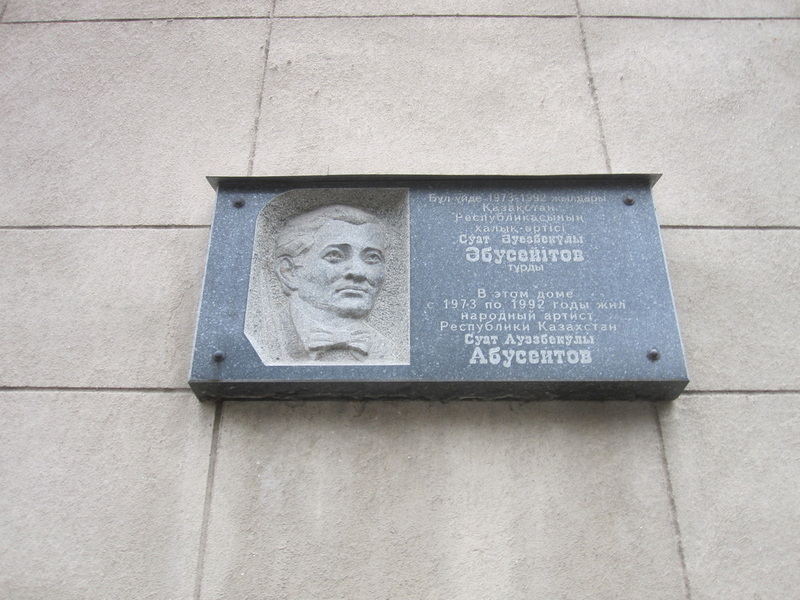 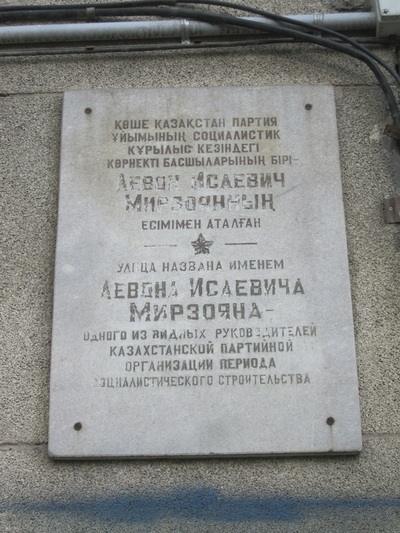 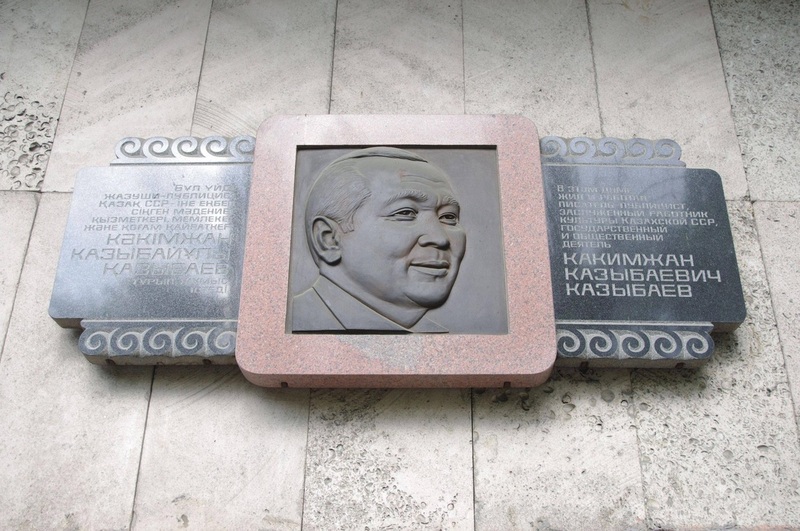 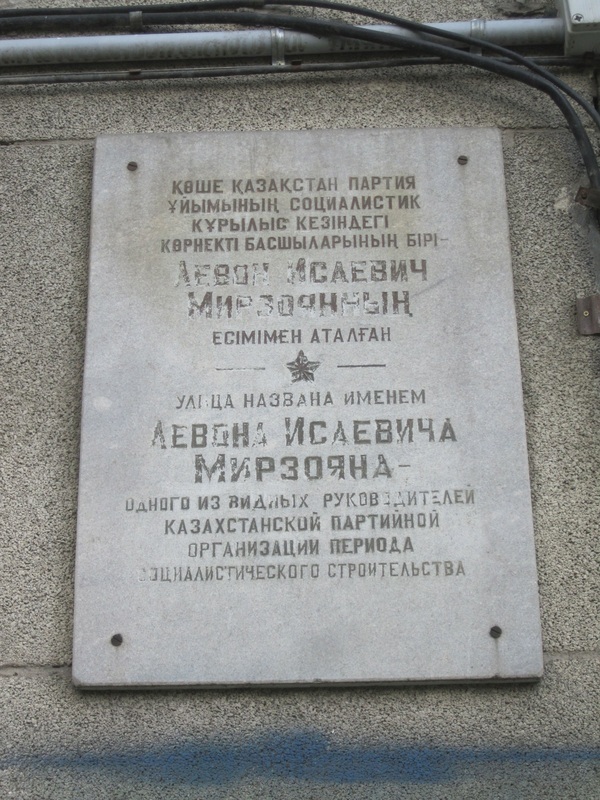 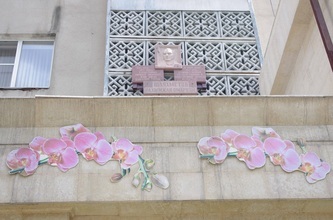 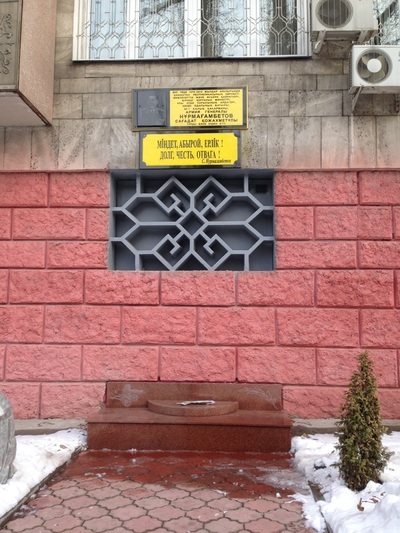 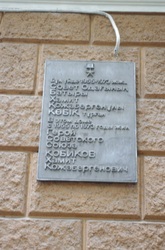 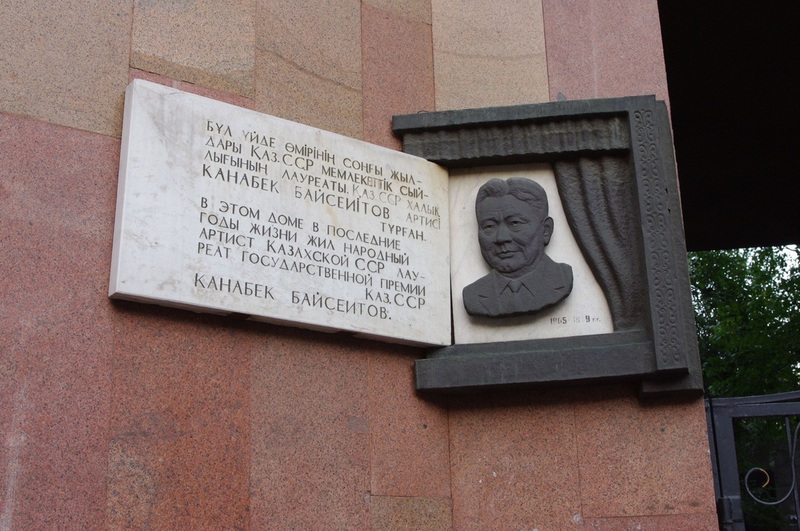 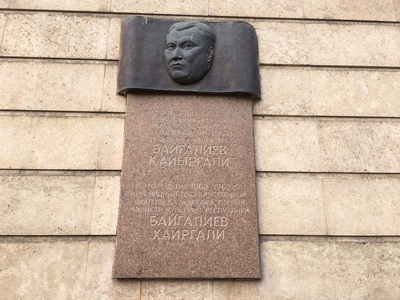 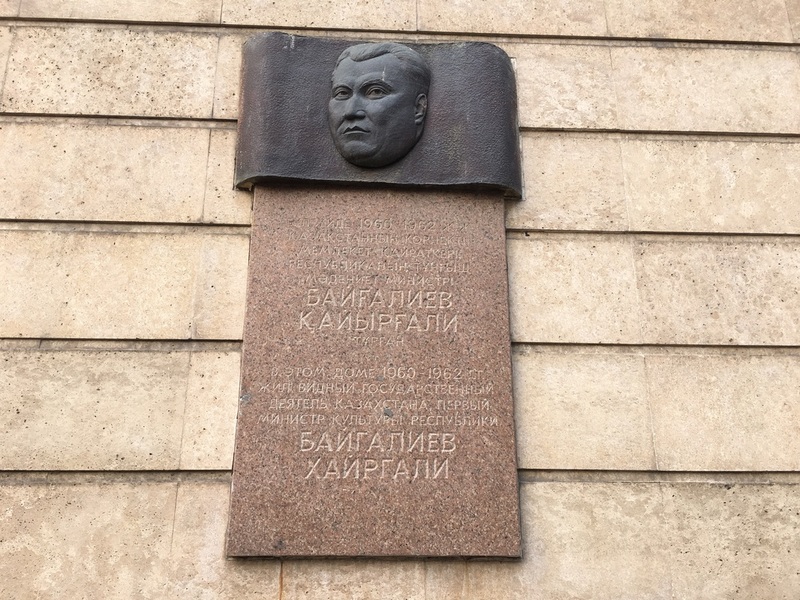 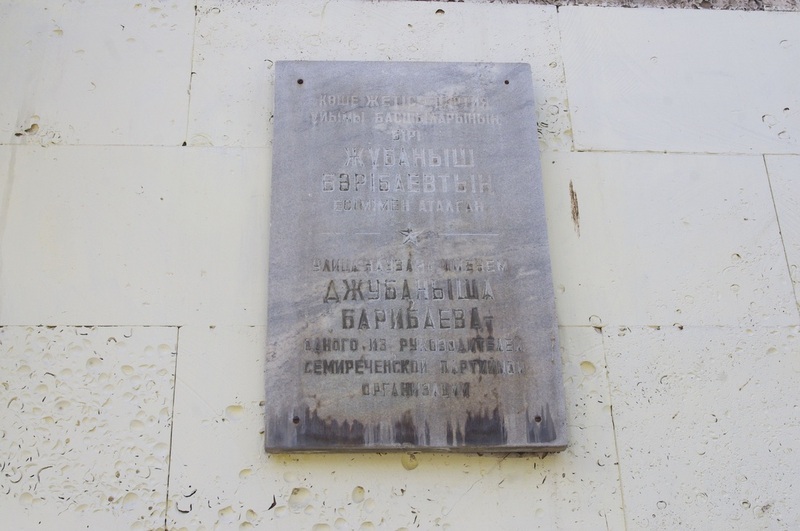 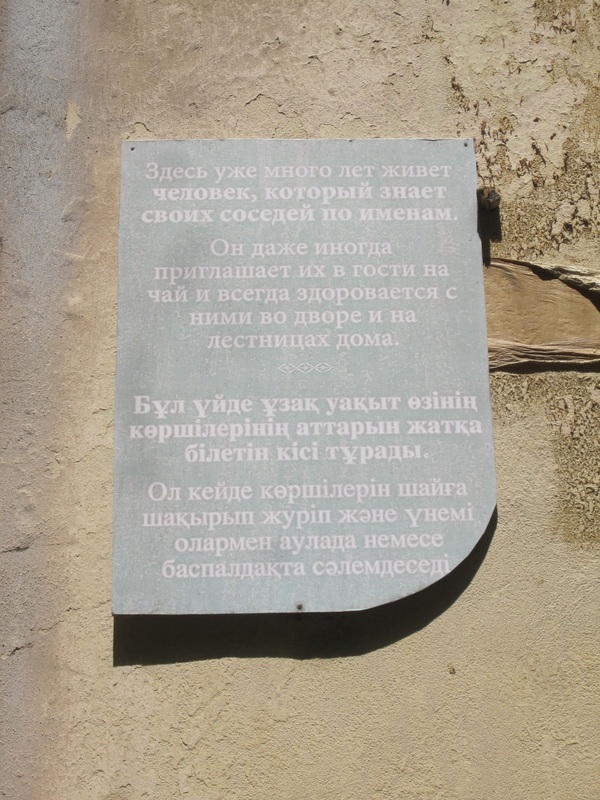 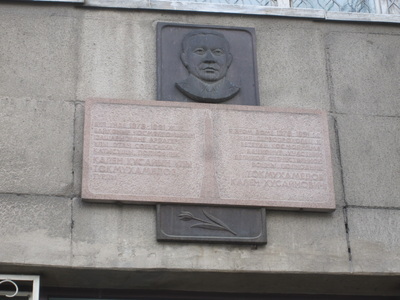 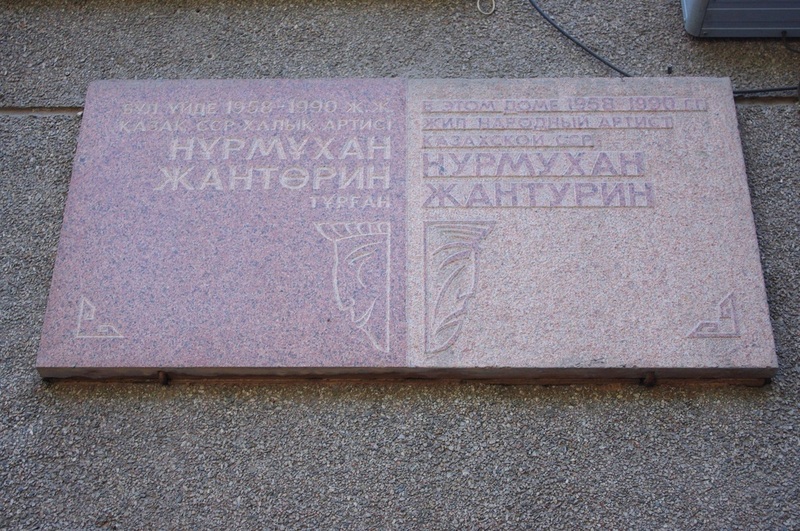 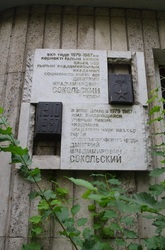 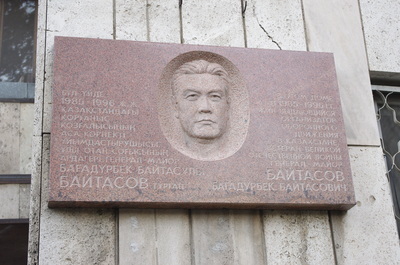 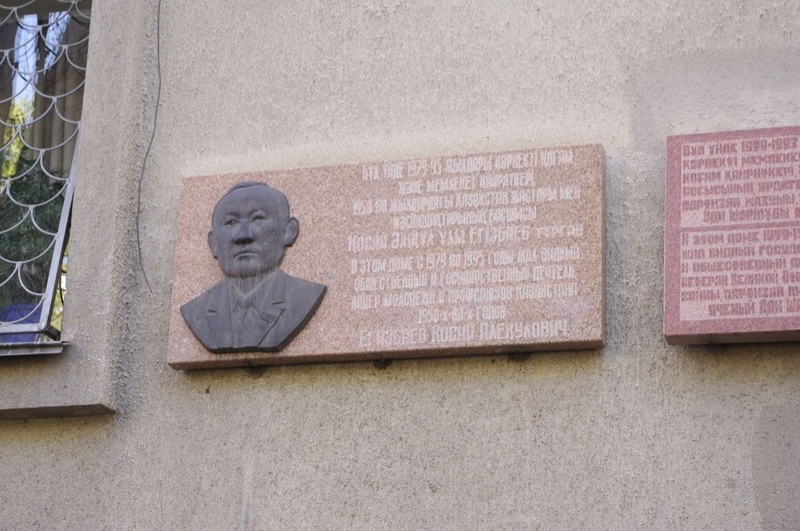 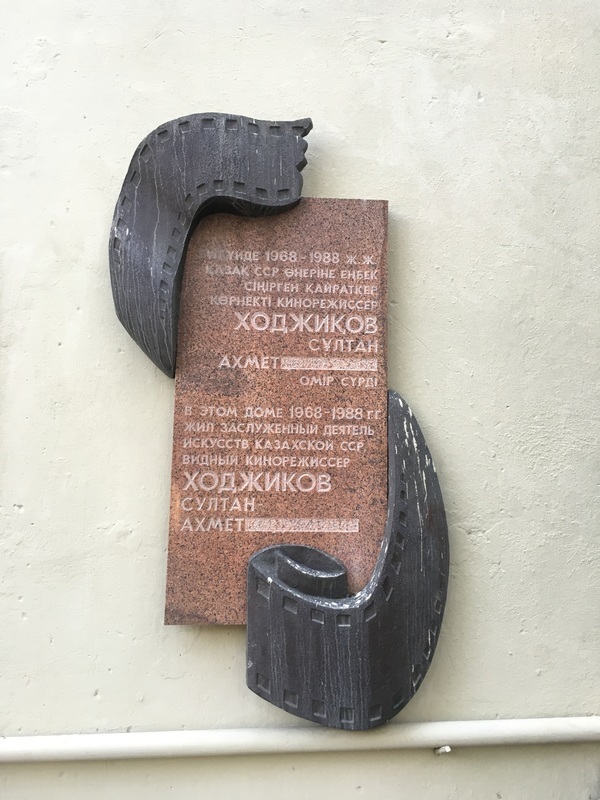 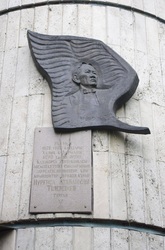 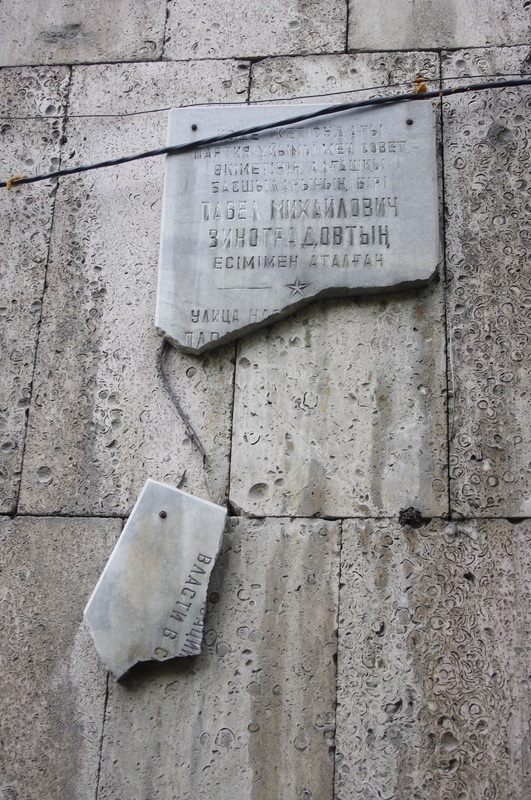 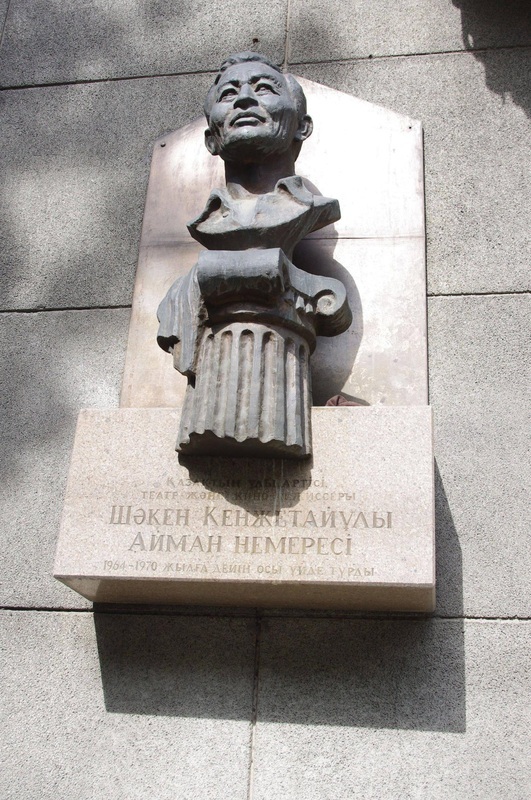 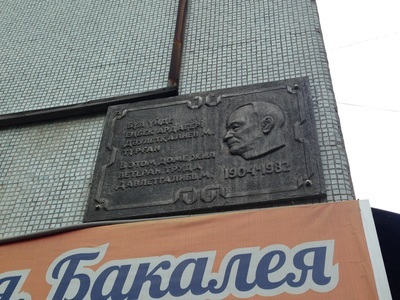 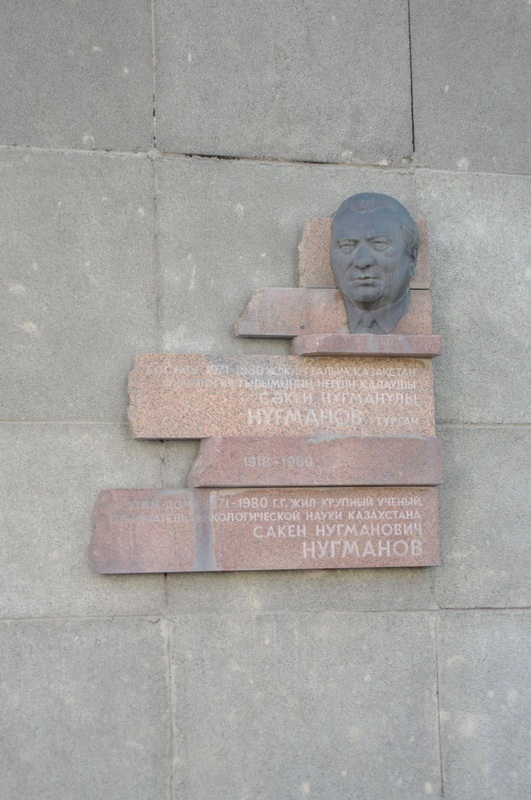 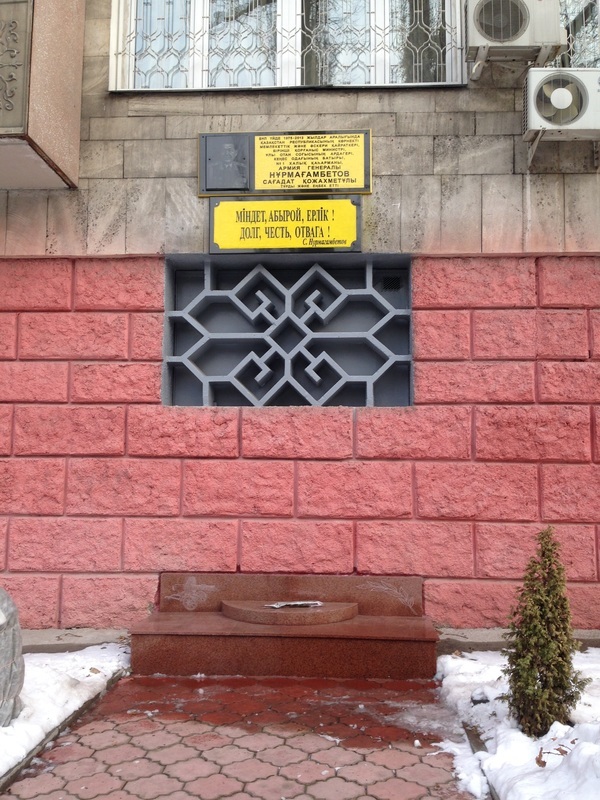 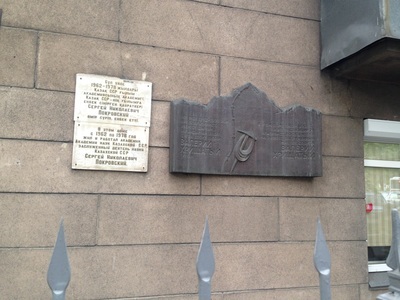 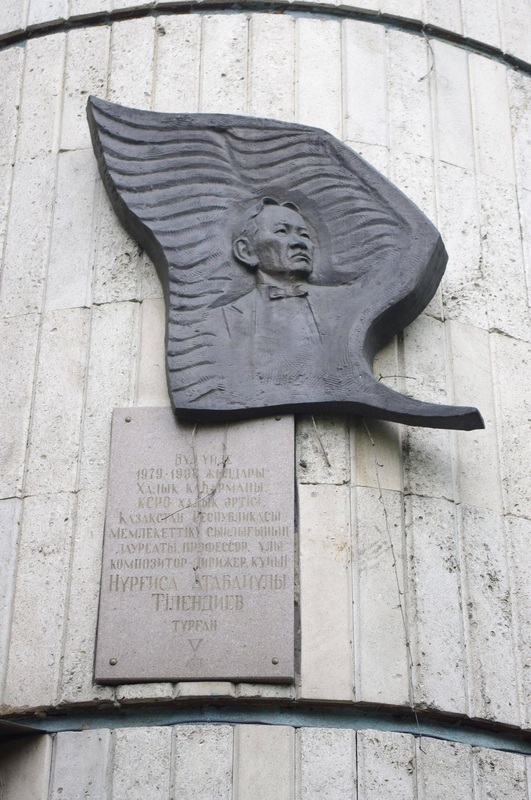 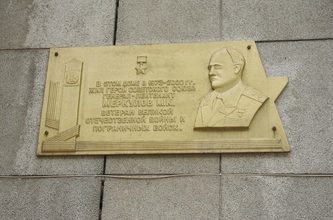 "For many years already a man has lived here who knows his neighbors by name," reads the plaque on Karasai Batyr street. 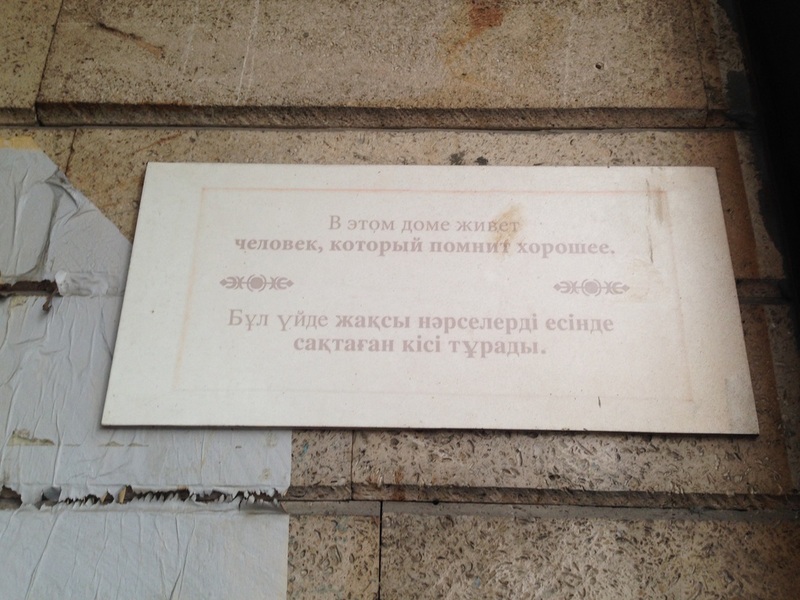 "He even invites them to his home sometimes for tea, and always says hello in the stairwell and the yard." As this artist surely meant to point out, the commemorative plaque was always for the glorification of the elite, and rarely for the common Joe. 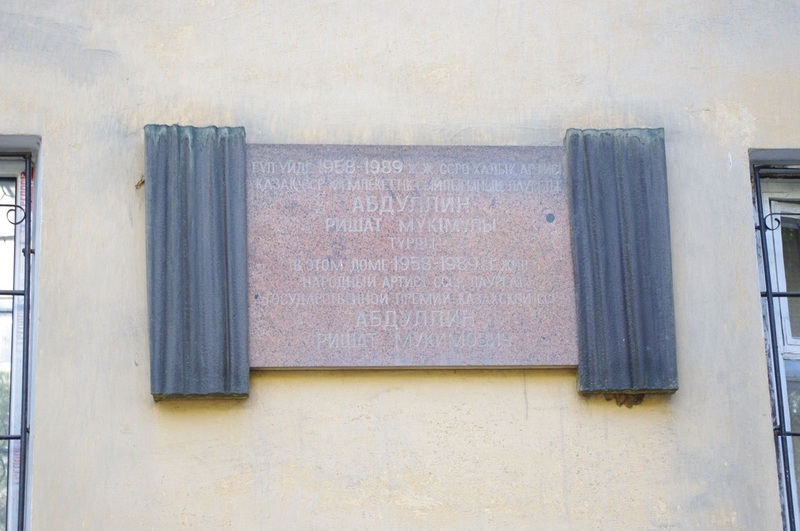 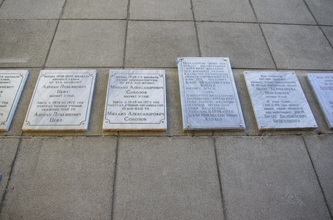 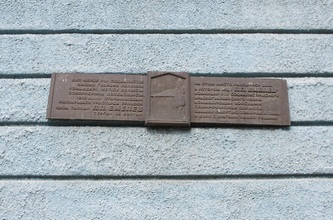 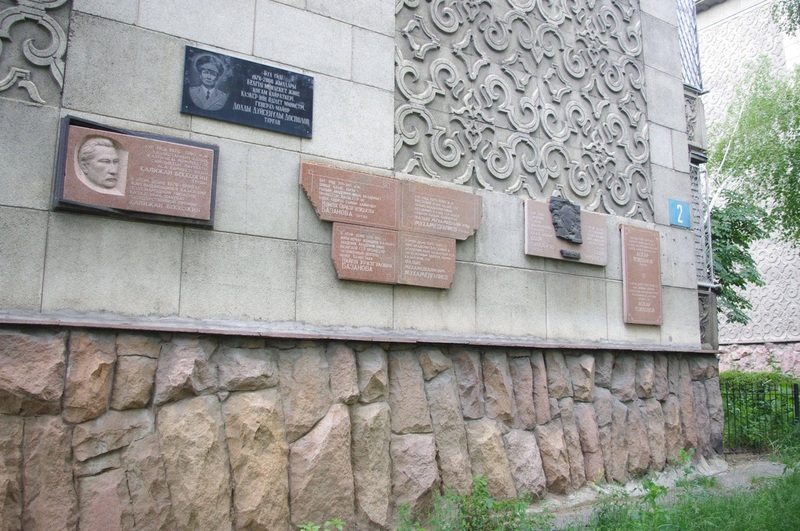 The plaques first caught on in Russia after the country's triumphant victory over Napoleon in 1812. 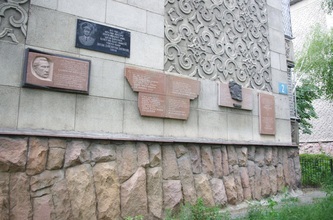 Patriotic fervor demanded that the war's heroes, and the nation's leaders at large, be recognized in stone. It was the same fervor that led Lenin, on April 12, 1918, to sign a decree called "On the Monuments of the Republic," urging the erection of "propaganda inscriptions" on buildings throughout the country, "works of art that will impact their audience not just with words and information, but in an artistic way, arousing an aesthetic feeling." 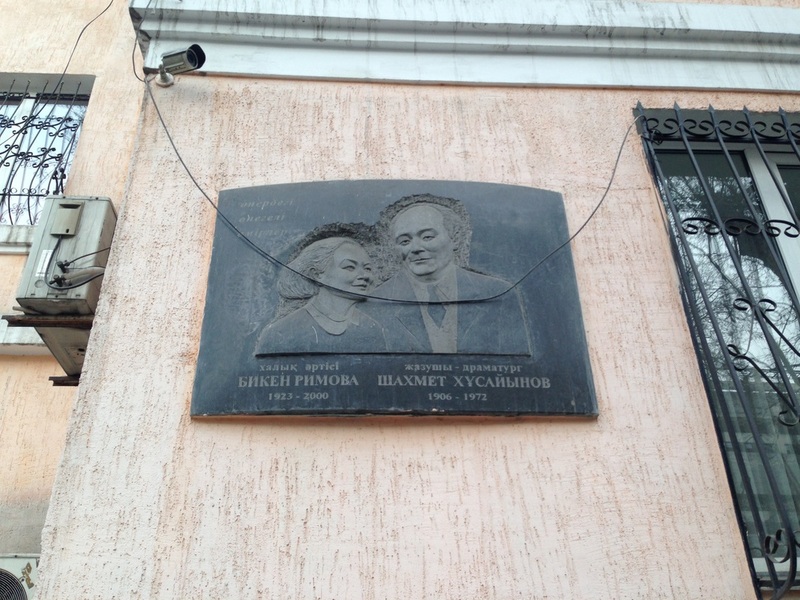 During World War Two, much of the Russian artistic elite, like the filmmaker Sergei Eisenstein or the composer Sergei Prokofiev, were evacuated to the safety of Alma-Ata, and it was after these years that the city's cultural life really bloomed. 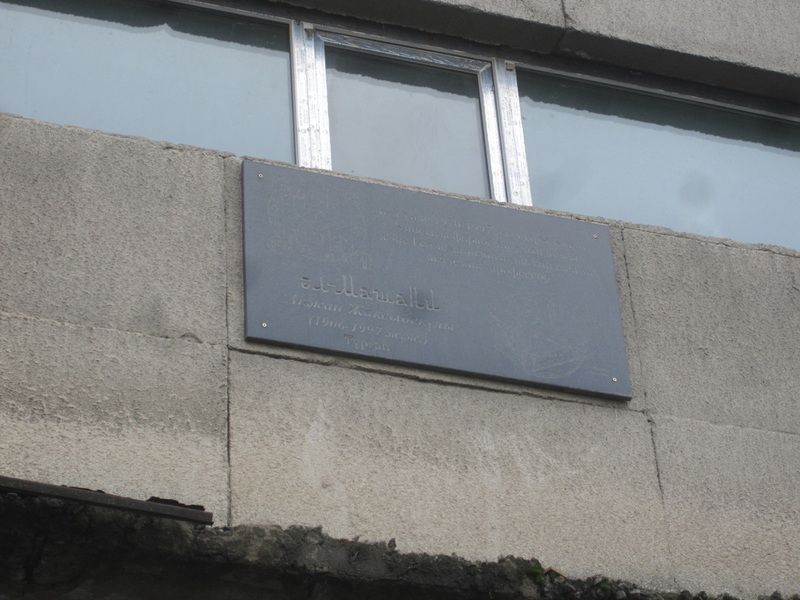 It's not surprising, then, that nearly all commemorative plaques can be dated to the second half of the 21st century. 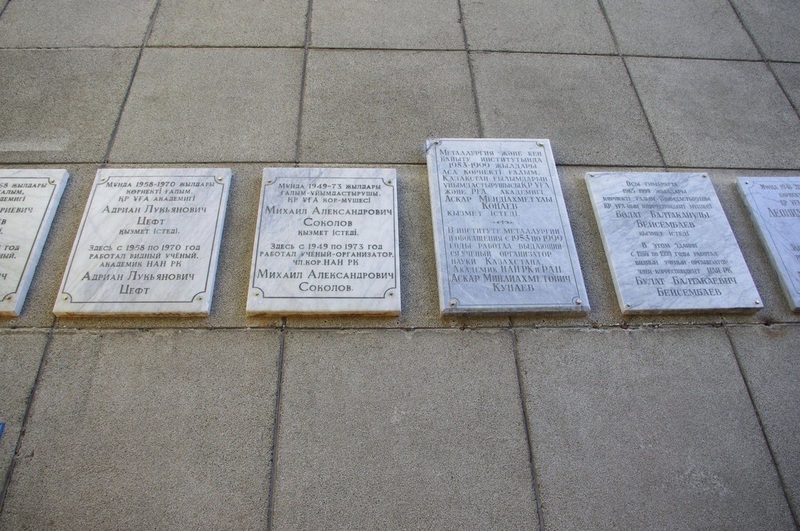 Speaking of dating, one last thing to appreciate about these slabs is that they provide us architectural detectives with some revealing clues. If one building has multiple plaques, and the years of inhabitation are listed for each figure, you will usually see that these accomplished people all moved into the house at the same time. 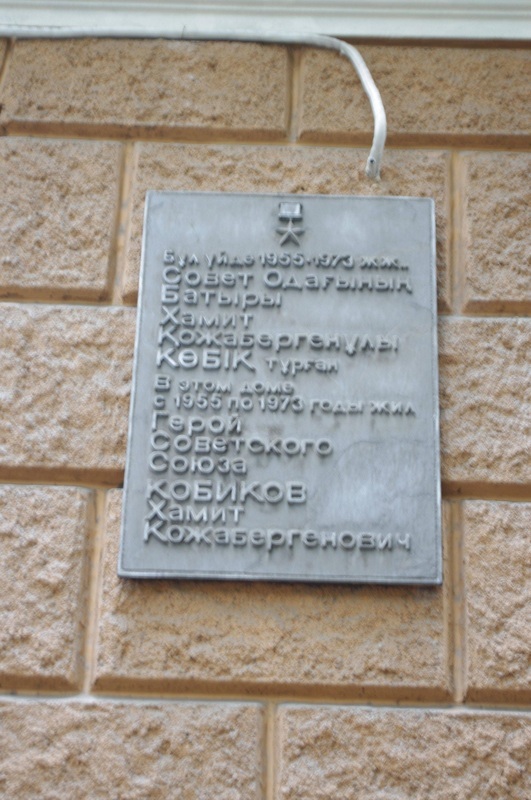 Apartments in the prestigious center of town would be reserved for the honored and lettered members of society, and by seeing when they all started decorating their trophy homes we can determine when the building's construction was completed. Some Stalinkas write the year in plaster on the outer wall, but otherwise we're left to guess when any building might've been put up. The commemorative plaque, not content to be just a memento of great lives or a work of art, is a window into the history city's construction.